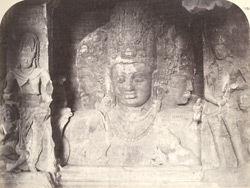 This photograph of the 1860s shows a triple-headed sculpture of Shiva at Elephanta. The rock-cut temple on the island was excavated in the mid-6th century and dedicated to Shiva. The north entrance leads towards this great triple-headed bust of the god which dominates the interior. The central full-frontal face of the god is meditative and serene. This is contrasted by the female and fiercer male profiles to either side. The fourth head of Shiva faces into the rock and so is not depicted. The island of Elephanta is accessible from Mumbai itself by boat from the Gateway to India.